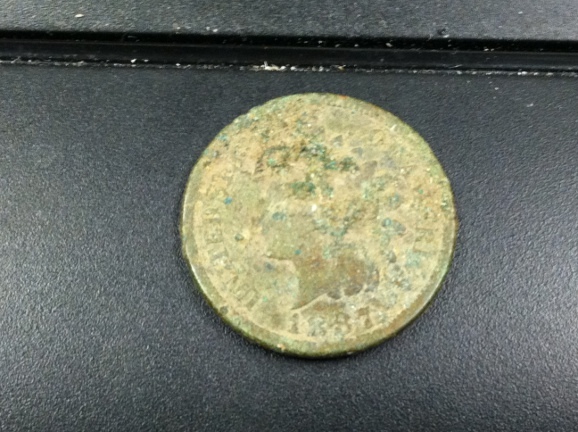 At lunch today, I dug up this 1902 Indian Head cent. The signal wasn’t perfect but it had enough of a sweet quality to it that I decided to dig it. 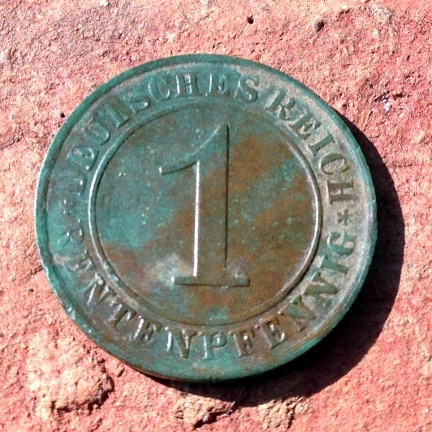 The coin was about 7 inches down. Also from the hole I pulled a couple of small aluminum foil pieces that may have been responsible for the signal being ugly and perhaps, they may have been the reason other hunters left this coin in the ground. 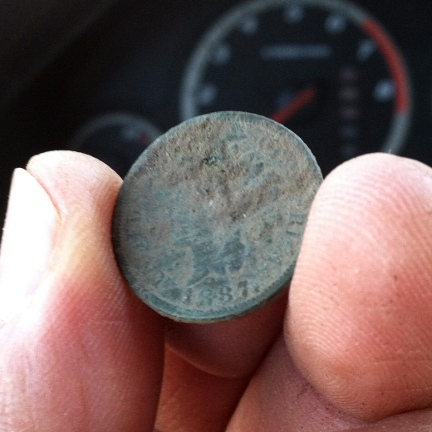 This is Indian Head cent number two for the year. Last year I found nine of these. I wonder if I can do better this year. I haven’t found silver in almost two weeks now but I am sure there is some old silver in this park. Incidentally, I have been to this park dozens of times before but I began finding coins here only in the last six or so times. For almost a year now, I have been hoarding all pre-1982 (copper) Lincoln cents. As you may have heard, the reason why the U.S. government changed the metal composition of the Lincoln cent in 1982 is that the cost in copper was higher than the face value of the coin. Before 1982, and even through part of 1982, all Lincoln cents contained 90% copper. All Lincoln cents made after 1982 to today, are mostly made of zinc clad on a thin layer of copper. I have about 30 pounds of pre-1982 Lincoln cents. I weighed a pound worth of copper cents and the face value of that pound was $1.40 U.S. So I can surmise that if cashed in my copper cents, I would get approximately $42 U.S. dollars. However, were the government allow me to melt the cents and sell the copper, I would get about $93 U.S dollars (based on the price of copper as of today, November 21, 2012). Of course, this is all academic at this point. It is illegal to melt U.S. Lincoln cents; period. I am hoping that by the time this changes, I will have a lot more copper cents and the price of copper will be higher still. Unfortunately, the only source of copper cents for me is the ground. I have to find them with my XP Deus metal detector and I have to dig them out of the ground. 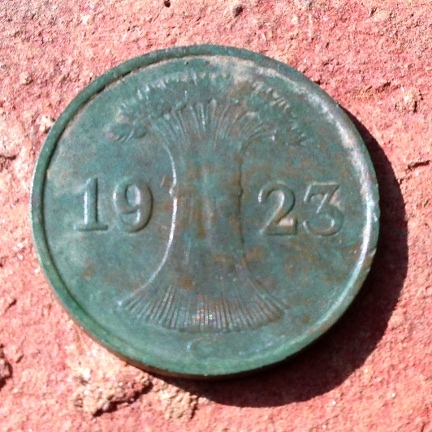 Fortunately, I love metal detecting and the profit to be made is entirely coincidental. Happy Hunting and thank you for looking! Metal detecting with the XP Deus metal detector is not always glamorous. Some hunts I find absolutely nothing. 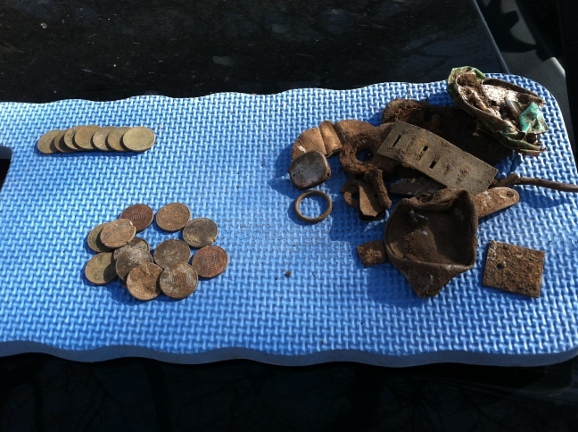 Some hunts I find a few coins and some paraphernalia. I wished I had saved all the pot pipes I’ve found since I started. I think I am to seven or so. Some were the fancy type that you buy on the Internet. This one is home made and I think it has more character. And if I am going to find pipes, better that they be pot pipes than crack pipes. I find crack pipes once a week it seems. I also find plenty of spoons with the little burn mark at the bottom of the spoon bowl. It is very hard to be a casual hunter and find silver and gold. You really have to put in the time to find silver these days. Sigh! my detecting time is going to diminish even more as soon as the boys go back to school. I returned to the secret yard at lunch today. I am working the site slowly so I am not covering a lot of ground in one hour. It was cold too, with temperatures below 40 degrees Fahrenheit and a nice brisk wind from the North making it feel much chillier than it was. 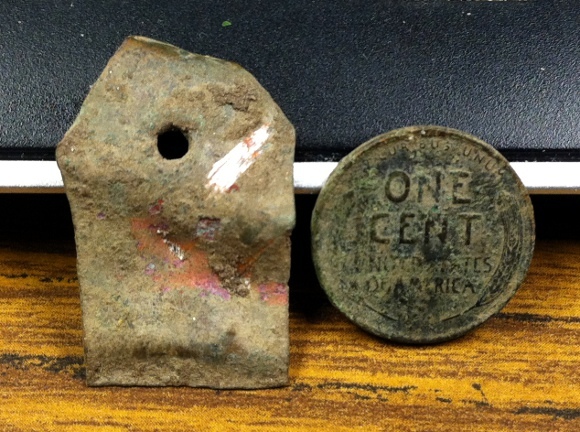 All I found was a 1936 D wheat cent and more old copper trash. I took a picture of one of the objects I have been calling tags. I’ve found about a dozen of these now at this site. I don’t know what they are but I know they are made of copper. The shiny spot on the upper right hand corner of the object is where I scored the metal to show the copper beneath the patina and dirt. 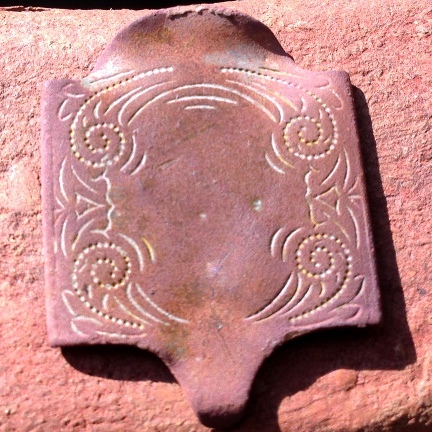 I have hunted homes from the 20’s on and I’ve never found copper whatsits like this one. Only when I hunt pre-1900 homes do I find this kind of thing. The wheat was about 5 inches deep and it gave a mixed pull tab/zinc penny signal. 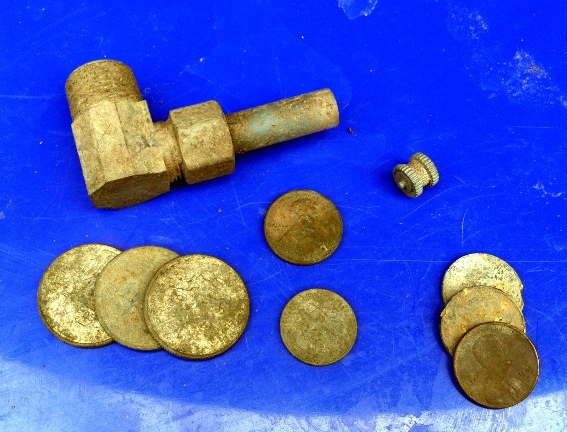 Along with the coin, I found an interesting mix of trash items that included parts of a cap gun, bronze/brass id tags, old pieces of copper slag, and a very corroded tin soldier which unfortunately, was far too toasted to see what war it was from. Everything I am finding tells me that the house that once stood here was continuously occupied until the very end of its life. There is relatively little modern trash. This is Indian Head cent number five for the year. I only found four in 2011. I went out hunting for lunch today. Although the temperature was hovering around the mid 50’s, the strong winds made it feel much colder. I had planned on hunting a walking path by the Arkansas river but meetings at my job didn’t leave me too much time. 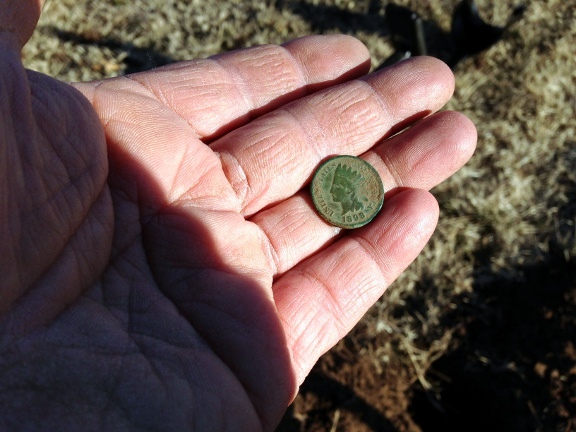 So instead I went to a site that I have researched carefully and where I dug up a 1951 wheat cent before. The site is TERRIBLE! There is so much rusted iron that the All Metal portion of the audio sounded like a continuous buzz. So I decided to switch programs on my V3i from the Deep Silver program to my tried and true Coin & Jewelry stock program. Five minutes after switching programs and ten minutes after starting my hunt I got a signal among trash that jumped from the low 70’s all the way to 80 and everywhere in between with hints of iron here and there. The tone was consistent among the trash though. The dominant frequency here was 2.5kHz and not 7.5kHz like it was on all the other Indians I’ve dug up lately. One problem with the signal (other than the iffyness) was that it was relatively shallow. The depth upon pinpointing was five inches. I generally don’t dig shallow iffy signals because 99% of the time they are trash but given the history of the site and the fact that I found the aforementioned wheat here, I decided to dig it. I am so glad I did! Sunday morning, I met up with Steveouke from the Friendly Metal Detecting Forum. 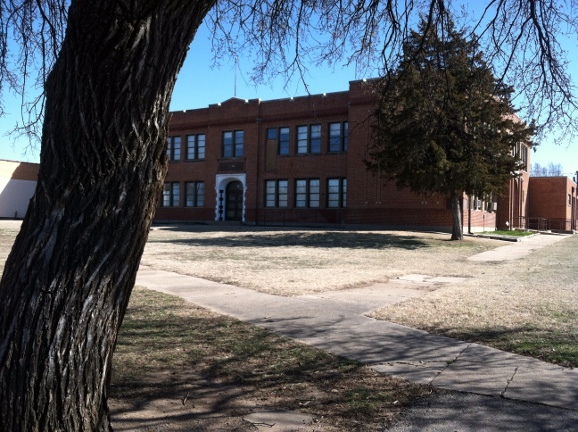 We decided to hunt a very promising site; an old abandoned middle school. From the architecture, I figured the building to be from the 30’s or 40’s. The sun was shining and the sky was vast and blue. My machine of choice for the hunt was the Garrett AT Pro. I really only hunted a very small area of the whole playground. I failed to find silver but I know silver is in there. 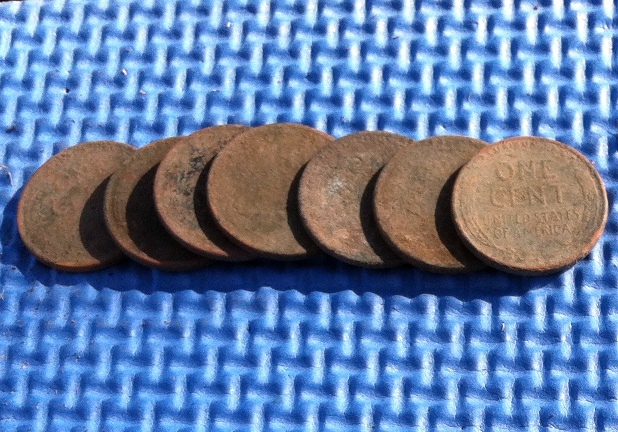 I found seven wheat cents all from the 40’s and 50’s and a bunch of zinc cents. 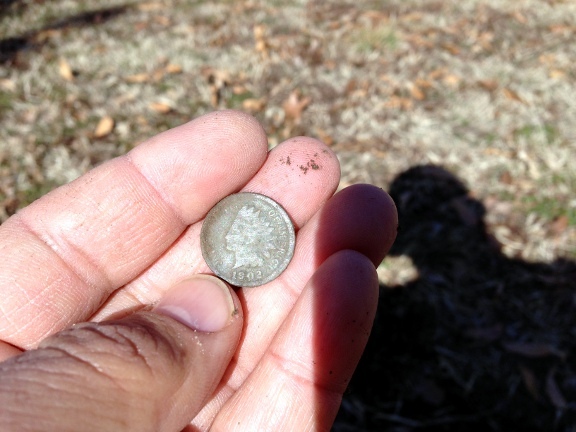 Meanwhile, a couple of forum members hunted the old trashy park and found some cool coins, jewelry, and of course, silver dimes. Sigh! The more I talk smack about the Etrac, the more these guys prove me wrong! LOL! Last, if you look carefully at the last picture, you will see a harmonica reed in the trash pile. I didn’t think these were really harmonica reeds since I find them often. Steveouke however, schooled me on the nuances of a harmonica reed and now I am a believer. I wonder why harmonica reeds are so common in old sites. No silver but not because I didn't try!